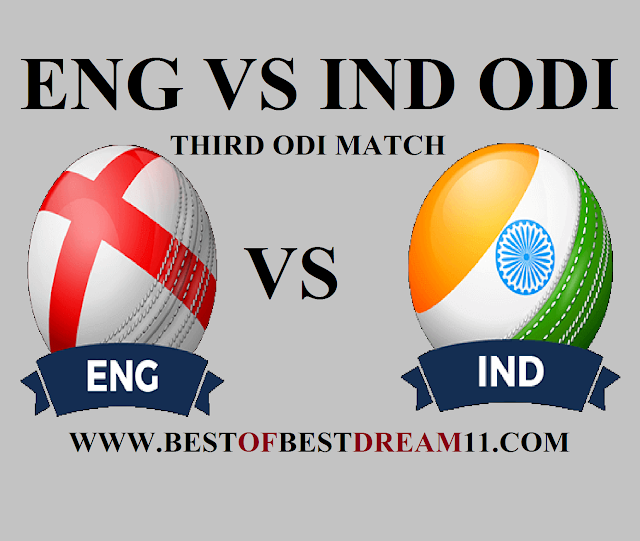 Welcome to our " BEST OF BEST DREAM 11 " FOR INDIA VS ENGLAND" Third ODI MATCH, dream 11 TEAM. Here is best " ENG VS IND " 3rd odi match dream 11 team for the fantasy user who are looking to make a strong team for maximum win.We are providing latest news ,match update,information about the match.The team is picked by using various factor on the basis of performance .ground stats and latest form. "The three-match series is level at 1-1 with INDIA winning the first match and ENGLAND bouncing back to win the second.India won the first match at Old Trafford by 8 wickets,but the visitors then lost the Lord's ODI by 86 run.The third one-day match has become very exciting,the team who won the match will also win the series. 1-England have a strong batting line up with Jason Roy and Jonny Bairstow opening the inning for them.The two have given a couple of good starts to the side in the series. 2-The home side will then bank upon JOE ROOT who got back in form on second ODI after scoring 113 run(116 balls). 3-In the bowling section ,the ENG spinners have shown their abilities. 4-The Indian team, with the world's best batting lineup,was completely shattered in the last match. 5- Talking about the Indian batting,Virat Kohli ,Rohit Sharma and KL Rahul are in good form,while other batsman has disappointing. 6-Kuldeep Yadav has proved to be the most successful bowler till now. 1- England selectors have released Dawid Malan and Sam Curran from the ODI squad ahead of the deciding match agains INDIA. 2-The selectors have also decided to bring in JAMES VINCE For the third ODI.J Vince has rewarded for his performance in domestic one day tournament. 4-Bhuneshwar Kumar will be in the fitness test before the match.His inclusion should put Siddarth Kaul on the bench. NOTE : Kindly revisit before the deadline for the latest updates.